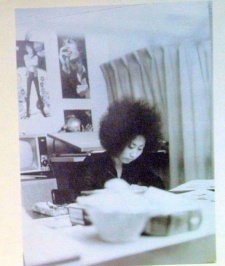 Mizuno was one of the first women to be a commercial success as a shoujo manga author, and she was particularly influential in the 60s and 70s. Members of the Year 24 Group cite her as an influence. She once worked as an assistant to Osamu Tezuka. Her best-known works are Fire! and Honey Honey no Suteki na Bouken. Hideko Mizuno (born 1939), herself a tomboy, disliked the melodramatic "mother" stories described earlier, and instead pursued fantasy (Harp of the Stars, 1960), westerns ("Red Pony," 1956), and comedy (Honey-Honey's Wonderful Adventure, 1966). She was also the only woman cartoonist to live (in 1958)in the now-famous Tokiwaso Apartments that became a (literally) low-rent Mecca for struggling young artists who would go on to define the style of the modern manga. The more famous residents included Ishimori, Hiroshi Fujimoto (1933-1996) & Motoh Abiko (born 1934)--a pair better known by the pen name "Fujiko Fujio", Fujio Akatsuka (born 1935), and Jiro Tsunoda (born 1936), as well as animator Shinichi Suzuki (born 1933).